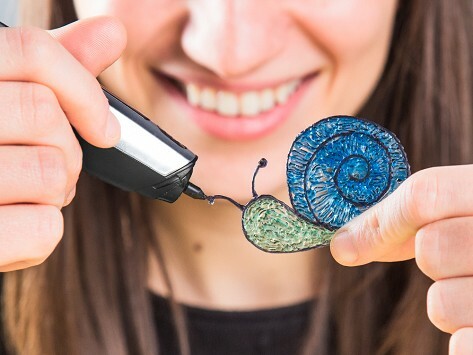 Take your 3D printing pen creativity up a notch with these amazing inks. Build sparkling objects with glittering ink, or glow-in-the-dark shapes. You can even experiment with heat sensitive ink that changes colors with the temperature. The UV light inside the pen cures the ink as you draw, hardening each line and letting you build almost immediately. And, because the ink stays cool (unlike with other 3D pens), it's safer to use. Dimensions: 4.5" x 0.75" x 0.75"
Drawings grow into shapes at your fingertips. 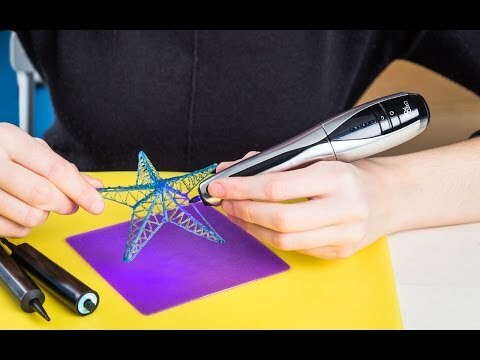 With CreoPop’s 3D printing pen in hand, you can create multi-dimensional pictures and structures freehand, in real time. Co-Founder Andreas Birnik thought 3D pens had untapped potential. Most of them work by melting plastic “ink,” which can make both the pen and ink dangerously hot. Plus, melting plastic doesn’t give off the greatest smell. CreoPop uses cool ink instead, so it’s even safe for kids to use. The ink is photopolymer (a fancy way of saying it’s light sensitive). The pen’s interior and adjustable UV light cures the ink as you draw without any heat. You can build dimension almost instantly. The cordless design charges via USB. That leaves you free to draw without a cord getting in the way. And CreoPop offers a variety of fun inks that can give your creations extra special effects. If you need help getting started, there are tons of videos online to help spark your imagination. After seeing the incredible things you can create, you’ll be inspired to work on increasingly intricate designs.